D.C.'s NoMa neighborhood will be taking on Toronto for the Most Improved Crater award. We’re going to start paring off these cities, from the top left, one each day. Kansas City will take on Minneapolis tomorrow. Then Oakland vs. Atlanta Monday, Houston v. Boston Tuesday, Pittsburgh v. Portland Wednesday and so on. The contestants span the country, but also include two separate spaces in D.C., the NoMa neighborhood pictured above. Thanks to everyone who send us entries. This is going to be very cool. Stay tuned for the competition, it all comes down to who gets the most votes. 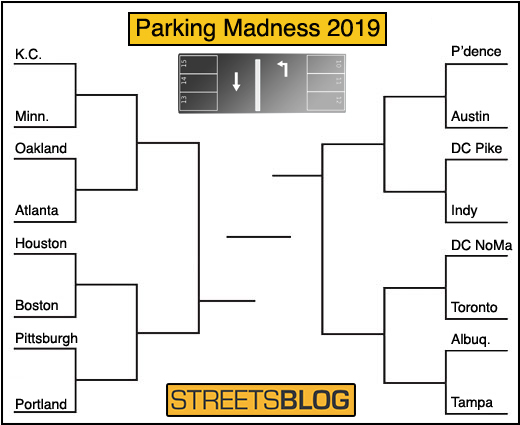 Parking Madness Kicks Off With Milwaukee vs. Jersey City – Cast Your Vote!